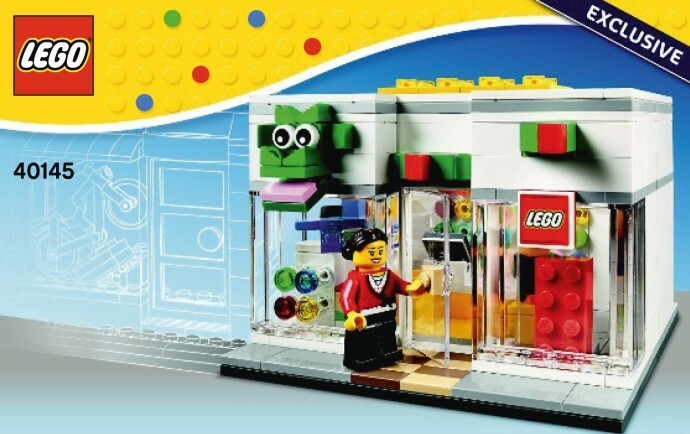 Instructions for a new LEGO Brand Store model, 40145, have been found on the LEGO Customer Services site by Brick Builder. I'm guessing that it will be used for brand store openings from next year (it states (c) 2015 on the back), replacing the current one, which has been around since 2012. Check out the image from the back of the instructions that shows interior details after the break. Wow! Another must have, I think. Big improvement on the current one. That looks pretty big for a store-opening exclusive. Hopefully it'll be for sale. 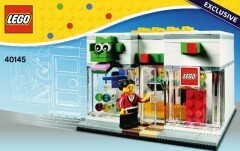 Weirdly, there was a CUUSOO (now "ideas") proposal last year for mini-stores, including a mini-Lego Store. It didn't quite look like this model, but I wonder if Lego wasn't covertly inspired by the proposal to make this version? Very nice! As @ResIspaLoquitor says, it seems quite large for a giveaway. Either its going to be for sale, or Lego are getting more generous with the freebies. Win-win I thnk! I hope this set is eventually sold in-store or on Lego Shop at Home. Would definitely enjoy adding this to my Lego town! The little Toys r Us shop needs some friendly competition. Trying to find the instructions on Lego Customer Service Page. Nice. I was just at my local LEGO store. Lovely, wish it would have come with a store employee minifig though. I can't find the instructions either. Wish this would be available more publicly than store openings where I never get a chance to get one... Love the custom boxes like the Ninjago box and Star Wars box! If this if going to be given away at new store openings, when are they opening new stores, and where?? Another one to lust after! And I agree they had a store mini they should have included it in the set! @lluisgib, thanks, was looking for the link. @lluisgib- I was looking for it too, so thanks from me too. Uhmmm.. great store building and a Padme hairpiece. Can't wait to get this. Sigh, come on Lego, open stores in Aussieland already! Makes me wonder if the retails stores are getting a design change on their frontage next year as unlike with the 2012 set this doesn't actually look as much like the bricks and mortar shops..? Incidentally, do they not give away these sets on the anniversarys of the store openings too? I know Glasgow did for their first birthday as according to the ACM I have four of them! The current store at Bluewater, UK has a dragon's body going through the shop walls and its head sticking out at the front. For those above dreaming of the PAB wall - Page 2 of the instructions does suggest that it is a boxed set as the minifigure is emptying the pieces out of the box. My Darth Vader would love this shop. Glad a minifig version is out, I think I would be a little more motivated to travel a to a grand opening by me if this set was available. Are the boxes with graphics printed, or sticker-ed? If stickers Im sure you will hear the usual grumblers about that. I think that there is room in a Lego City for this one. I can only hope that Lego actually sell this set in their stores. I can never get to the Store openings and will not pay the prices they were selling for on the second market. 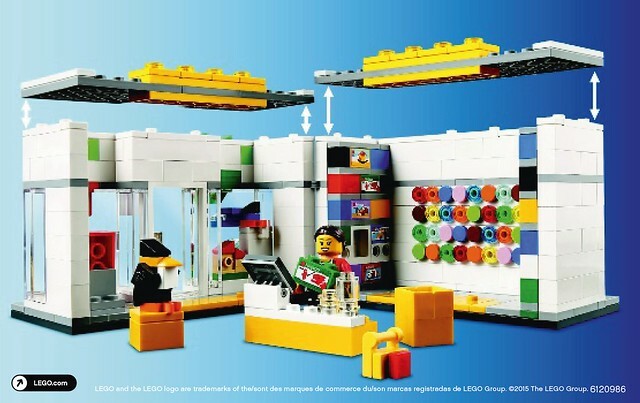 Really wish Lego would make a modular of their store someday. Is there anyone who was fast enough to download the instructions for 4000019 before it was removed again ?? I'll like to have it. This looks awesome! I hope it is available for purchase since there is already a Lego store where I live. So doubtful they will open another one. That looks nice. I wish we got the Padme hair in a new color, but, since it's an exclusive set that I won't be able to get, I'm glad it isn't. I'll probably skip this one, as I am not keen on Mini-Models. Is there a site tracking the next official Lego Store openings? TLG REALLY needs to start selling online these store opening sets a few months after they open a store, so that the rest of the world has a chance to buy them. Many are outstanding little builds, and most of us can't fly around the world to get a little set. Come on LEGO! Mini and micro scale sets are becoming the rage as folks run out of space at home, and the prices should be much lower than with a larger set. This would lower resellers' profits and give everyone a chance to buy one at a more reasonable price.